If there's one thing I regret not hoping on the train for in recent comics, it would be Marvel's Annihilation event a few years back. Cosmic on a grand scale, and full of all the drama and action you'd expect, it really put Marvels cosmic library back on the top shelf. Now the universe is set to shake, as Marvel.com reports architects of the annihilation; writers Dan Abnett and Andy Lanning set up to do it again, with the oncoming Thanos Imperative starting in May. 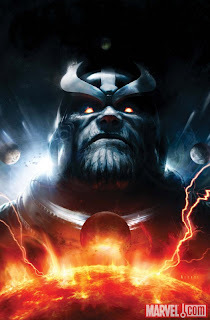 As Nova, the Silver Surfer, the Guardians of the Galaxy (especially Star-Lord), Quasar and more, seek to oppose Magus and his Dark Gods from taking control of the Fault, a rip in space and time, Thanos, the Mad Titan returns. Forever trying to win the heart of death, whose side is the cosmic nasty truly on? And more importantly who will live to tell the tale? Find out when the new reader friendly The Thanos Imperative: Ignition one-shot (Aleksi Briclot cover shown above) touches down in just two months time.